The Spanish Water Dog is a herding breed! The AKC recognized it as part of the herding group in 2015. This is just one of many intriguing details about this exotic breed. Let’s take a closer look at the Spanish Water Dog. Like most herding breeds, the Spanish Water Dog is highly intelligent. The mind of a Spanish Water Dog is always in motion. This means that as the owner of a Spanish Water Dog, you must keep their minds focused on constructive tasks. Otherwise, they become bored and they get into mischief. Be prepared to devote a lot of your day to playtime and enrichment. When you must leave them alone, give them brain game toys or food puzzles to keep them entertained. Spanish Water Dogs are bred to work. They make fabulous all-around working dogs on farms. They thrive when they have a job to perform. Spanish Water Dogs are smart and driven, so they are very trainable. With the right motivation, you can train them to do just about anything. This dog will be the star student of the obedience class. This is a protective breed. They form close bonds to their families and they will guard the homestead from intruders. They make excellent watchdogs. The Spanish Water Dog is a herding breed. Even if you do not live on a farm, your pet will retain herding instincts. Your dog may try to herd the neighborhood children or the family cat! The Spanish Water Dog was bred to be an all-around utility dog on Spanish farms. Their masters would use them to herd livestock, hunt, and retrieve items from the water. They also guarded the homestead against intruders. Although the breed was only recently recognized by the AKC, it has actually been around for hundreds of years in its native land. The breed is especially admired for its ability to dive underwater and retrieve items from the depths of up to six meters. Until recently, the breed was practically unknown outside of Spain. The Spanish Water Dog goes by other names including the Andalucian Turk, the Perro Turco, and the Perro de Agua Espanol. Female Spanish Water Dogs weigh between 31 and 40 lbs. Males weigh between 40 and 49 lbs. They stand between 15 and 19 inches tall. The tail is sometimes docked and sometimes natural. Their most distinctive characteristic is their wooly coat that comes in many color varieties. The most common colors are black, white, brown or particolored, but not tricolor. Obedience training is an important component of responsible pet ownership. It is best to start training at a young age. Sign up for a puppy kindergarten class at the earliest opportunity. Make sure you find a trainer that uses positive reinforcement methods. Avoid trainers that employ dominance-based tactics. Do not use painful equipment such as pinch collars, shock collars or choke chains. Spanish Water Dogs are eager learners. They are highly motivated to work for praise and treats, so draconian methods are unnecessary. Keep training sessions short, upbeat and fun. Spanish Water Dogs love to master new tricks! Spanish Water Dogs also make great competitors in canine sports such as agility, dock diving, and rally obedience. 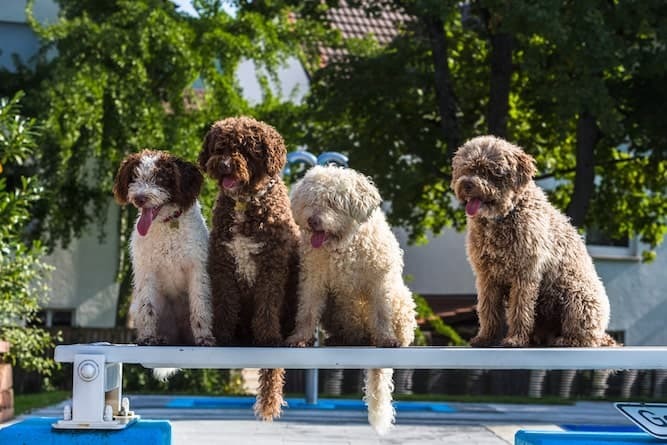 If you are up for the fun and involvement with training your Spanish Water Dog then check out these FREE Dog Training RESOURCES. The Spanish Water Dog’s unusual coat does not need to be brushed, but it does need to be clipped regularly. If the coat is not clipped frequently, it will form cords, which some people prefer. Corded coats require special upkeep, so seek advice from a professional groomer if you acquire this breed. Spanish Water Dog shedding is minimal and most people consider the Spanish Water Dog hypoallergenic. Therefore, they are good dogs for people who suffer from allergies. The Spanish Water Dog is closely related to the Portuguese Water Dog and is sometimes mistakenly identified as a Portuguese Water Dog. The Spanish Water Dog Club posits that the Portuguese Water Dog is probably an ancestor of the modern Spanish Water Dog. Although they have many shared characteristics, there are a few key distinctions between the breeds. 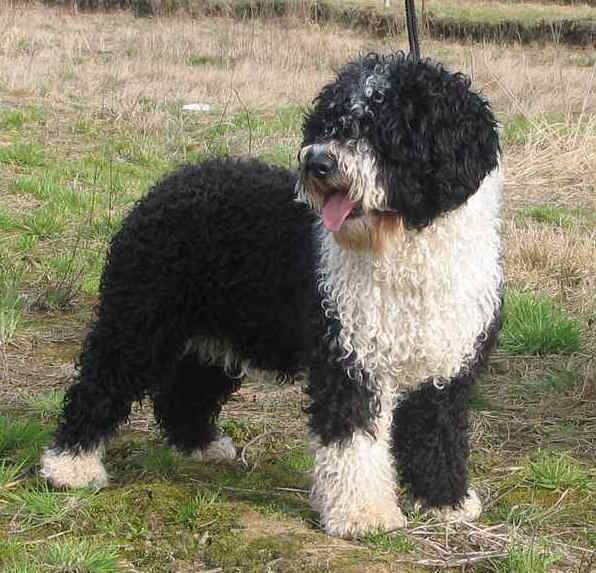 The most notable difference is that the Portuguese Water dog is slightly taller and heavier than the smaller Spanish Water Dog. It is important to establish a relationship with a veterinarian as soon as you bring home your new pet. Like all dogs, Spanish Water Dogs need to visit a veterinarian at least once each year for a physical exam. They need flea and heartworm preventative every month without fail. The life expectancy of a healthy Spanish Water Dog is between 12 and 14 years. Note: if you agree that your health and your dog's health should be a top priority then get a copy of The Ultimate Guide to Dog Health. Your Spanish Water Dog friend will love you for it. If you wish to locate Spanish Water Dogs for adoption, the first thing to do is contact the Spanish Water Dog Club of America. This organization runs a rescue program for Spanish Water Dogs that need to find new homes. Most of the dogs in the rescue program are older, which can be a great thing! Older dogs are calmer, are usually housebroken and past the puppy teething stage. Some people think that dogs in rescue groups are “damaged” but this is rarely the case. Most dogs wind up in rescue through no fault of their own. Sometimes their owners are going through a divorce or a financial crisis. Spanish Water Dogs are not common in American Animal Shelters, but it is still worthwhile to visit your local animal shelter and inquire. There are also a number of national adoption websites such as Petfinder.com that will allow you to search by breed and zip code. The Spanish Water Dog cost from a rescue group is between $75 and $200. Rescue dogs will be spayed/neutered, vaccinated, heartworm tested and sometimes microchipped. If you cannot find the right match through adoption, you can look into purchasing a Spanish Water Dog through a responsible breeder. The Spanish Water Dog price from a reputable breeder will be over $1,000. The American Kennel Club maintains a list of Spanish Water Dog Breeders. 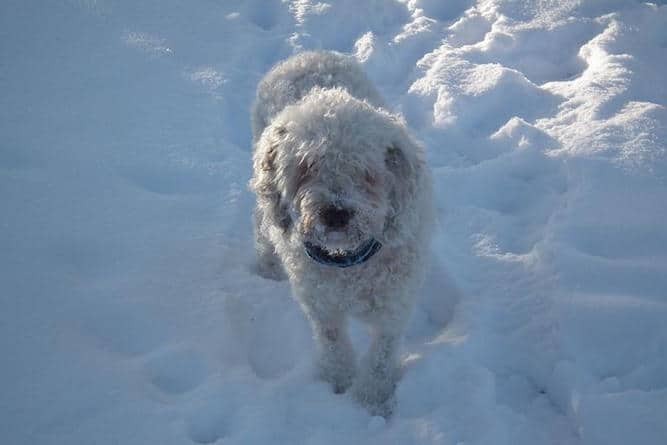 You can also contact a representative from the Spanish Water Dog Club of America and ask for recommendations of responsible breeders in your area. This is a rare breed, so you may have to travel to find a breeder. It is important to visit the breeder personally so that you can make sure that the conditions are clean and humane. Do not order a Spanish Water Dog puppy over the internet. There is no way to verify that your puppy comes from a reputable source. Quality breeders will welcome a visit from prospective buyers. They will also be happy to answer all of your questions about the breed. They will probably ask you questions as well and might even ask for references. High-quality breeders do not overbreed their dogs, so you may have to wait for Spanish Water Dog puppies to become available. Once you locate a breeder with Spanish Water Dog puppies for sale, the breeder will help you select the right puppy for your home. They will ask you to sign an agreement verifying that you will get your pet spayed/neutered at the appropriate age. They will also stipulate that you return the dog to the breeder if things do not work out. Good breeders never want their dogs to end up in shelters. Since this sometimes happens, your breeder may occasionally have an adult Spanish Water Dog for sale as well as puppies. Conclusion: Why the Spanish Water Dog? Without a doubt, the Spanish Water Dog is a scarce and stunning breed. When you walk down the street with a Spanish Water Dog by your side, you are sure to get a lot of attention and questions. However, it is important to select a dog by its personality and not by looks alone. Be sure that the Spanish Water Dog temperament is a good match for your household before acquiring one of these dogs. Next post: Wire Fox Terrier Temperament (Quick, Bold & Fearless): Can You Handle It?